The PaceMaster Gold Elite treadmill is definitely one of the best treadmills out there below $2,500. It answered the frame concern most people had with cheaper Pacemaster models. This machine is perfect for everyone. It exceeds the strength, feature, quality, and specs expectations of a $2,200 unit. However, the price tag might be a little too much for some people. If this is the case, you might want to choose a cheaper Pacemaster model or visit our best buy treadmills page. The 3.0 HP continuous duty McMillan motor offers you power which are mostly found on treadmills above $2,000. This motor has a speed range of 0.5 to 12 mph and an incline range of 0% to 15%, adjustable in 0.5% increments. Thus, allowing for more intense workouts. The 20" x 60" running space is longer than what cheaper Pacemasters offer. This provides you even more room to move and be comfortable during your exercise. The Tri-Flex Impact Shock Management System gives PaceMaster Gold Elite treadmill users maximum shock absorption. This cushions impact on the ankles, knees, hips and backs which is perfect for those coming off an injury and those trying to prevent one from happening. 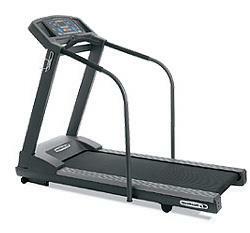 The PaceMaster Gold Elite treadmill also comes with tons workout programs. It has 3 custom programs, 5 heart rate programs, and 7 workout programs with 9 levels of intensity. All these are offered to you for more variety and flexibility. It also has 4 user IDs and fitness evaluation so you can have a more personalized workout. The PaceMaster Gold Elite treadmill has a lifetime warranty for its frame, 12 years for the drive motor, 5 years for parts and a year for labor. These simply show just how much the company is oconfident of their product. I recommend the PaceMaster Gold Elite treadmill. But before you buy, you might also want to check out our best buy treadmills page to see if there are other treadmills out there that would suit you better. I’m currently having a hard time locating an internet retailer carrying the PaceMaster Gold Elite treadmill, so for now, I suggest you locate a dealer near you through PaceMaster.com. It is being sold for just $2,199.